In a previous post we gave you 5 reasons to buy Fromm’s pet food. In our guide below you will see how affordable Fromm’s pet food is compared to other top brands. We got out our calculators (literally!) and compared a lot of dog food. Here’s a snapshot of how Fromm’s compares to other brands. 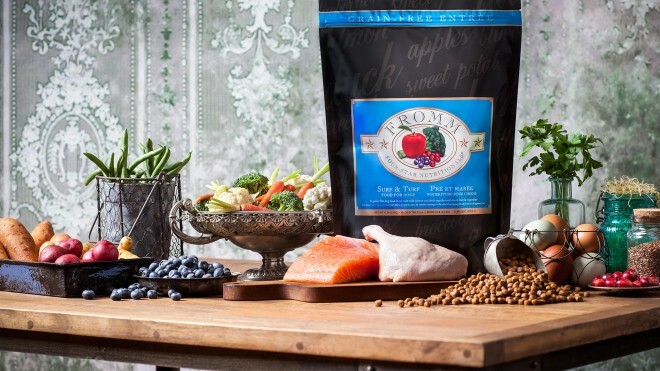 We were shocked–in a good way,–to see just how much more of a value you can get with Fromm’s foods. You can get this for under $1.00 per pound when you join Abracadabra’s free loyalty program. Petco and Petsmart sell brands like Pedigree (1 Star), Iams (2 Stars), Kibbles n’ Bits (1 Star), and Purina Beneful (1 Star) in this price range. These foods contain poor quality ingredients such as by-products, non-specific protein sources (e.g. animal fat and animal digest), low quality grains (corn gluten meal, brewer’s rice), and chemicals (food coloring, phosporic acid, and propylene glycol, the active ingredient in anti-freeze). Great news! There’s no need to sacrifice your dogs health when you can get Fromm’s for the same price, or cheaper! Ingredients Include: All the quality ingredients of Adult Classic plus Duck, Lamb, Oatmeal (great fiber promotes colon health), Alphalpha Meal (source of chlorophyll), Carrots, Lettuce, and Celery. You can get this for as low as $1.18 a pound with our loyalty program. Foods like Purina Pro Plan (2 Stars), Iams Healthy Naturals (2.5 Stars), and Eukanuba Premium Performance (2 Stars) cost $1.20-$1.55 per pound at stores like Petco and Petsmart. These foods contain poor protein sources like by-products, and animal digest. They also have cheap grains like corn meal, brewer’s rice, and corn gluten meal. These grains have no nutritional value and often cause allergic reactions in dogs due to mold and grain mites. This food is for those that want nothing but the best for their pet. The ingredients were so impressive, we couldn’t even find a comparison in its price range, which we offer at the best price. It’s as low as $2.18 per pound with our free rewards program. Moral of the story: no matter what your budget, you can treat your pet to quality food. At Abracadabra, every pet that walks through that door is a part of our family, and we want to see them happy and healthy! Ask us questions in the comments about your pet or stop in to talk to one of our trained pet professionals. Want to learn even more about Fromm’s? Visit the Fromm’s website. *Petco and Petsmart prices are from their websites on December 15, 2015 and are subject to change.